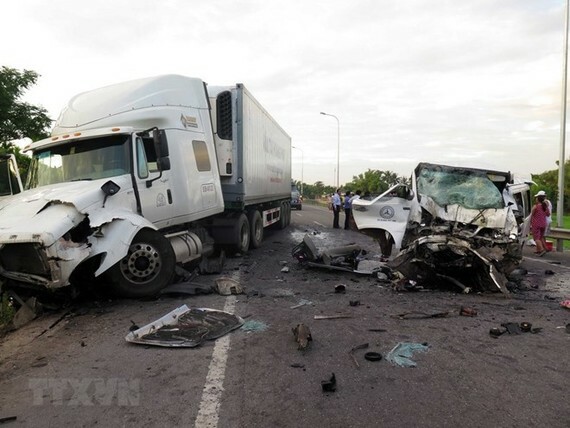 Up to 13 people were killed and four others were severely injured in a traffic accident in the central province of Quang Nam on the early morning of July 30. The accident occurred at about 2.30am on National Highway 1A’s section in Vinh Dien town of Dien Ban township. A car carrying 17 passengers, en route from Hai Lang district of central Quang Tri province to south central Binh Dinh province, collided with a container truck going in the opposite direction. Ten people inside the car were killed on the spot while three others were dead on the way to the hospital. The wounded have been being treated in hospitals in Dien Ban township and Da Nang city. Authorities of Quang Nam province offered five million VND to each family of the deceased and two million VND to the injured. According to the National Traffic Safety Committee, from December 16, 2017 to June 15, 2018, nearly 9,000 traffic accidents were recorded nationwide, killing 4,103 people and injuring 7,027 others, each figure down year-on-year. Of these, 8,889 accidents were on roads, 62 others on railways, and 40 on inland waterways.